Instagram stores most of your activities on the social network since you joined, including photos and videos you’ve posted, links you’ve liked, comments, your friends, people you follow, your hometown, last location, linked accounts, messages you’ve sent or received and more. Instagram use these details to learn more about the user. So they can deliver ads and contents based on user’s tastes, interests, and location. It is better to keep a copy of all the information Instagram storing on you. Here’s how to download a copy of your Instagram data. Sign into your Instagram account first. 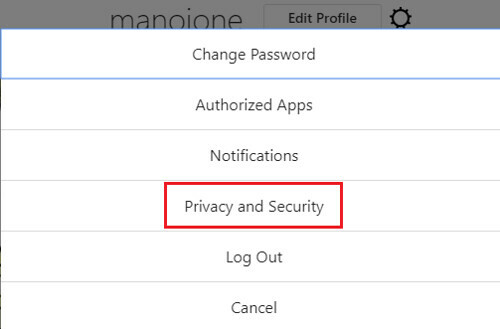 Click the Settings icon on your profile page and choose “Privacy and Security” from the popup box. A new page will open with relevant settings. Scroll down to the bottom to locate “Account Data” and “Data Download” options. Click “View Account Data” link to know what kind of information is stored by the network. It will list the details like your date of joining, password changes, accounts you follow, accounts following you, accounts you blocked, login activity, date of birth, search history and others. Go back to the previous screen and find “Data Download” to get the details in zip format. Once you requested the file, Instagram will ask your email address to send the copy. It may take up to 48 hours to finish the process. Confirm your request by entering your Instagram password and tap the “Request Download” button again. Wait until you receive a notification email from the network along with the download link.